Weekly we share brief updates about worship services, special activities and events. Our update is called the "Bidding Bell" - or, in today's world the electronic Bidding Bell or "eBB". It's named for our church's tower bell, historically of the type known as a Bidding Bell which is rung as a call to worship. Help us keep you informed by joining our email distribution list. Just complete the form below. We respect your privacy. Your email will only be used to provide information about church activities and will not be shared. Thank you! 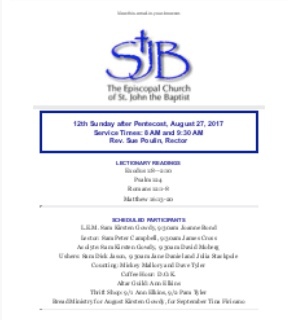 You have been added to the St. John's email list.